Place the main electrical panel on an upper floor, rather than the basement. Implement a waterproof disconnect switch on the exterior of your home to deactivate the electricity supply in the event of a flood. Build a secondary electrical service panel in an outbuilding, which can become the property’s main power source if floodwater damages the main electrical panel inside the house. If you’re building a new home in a flood-prone area, the first of these options is the easiest and most cost-effective way to meet the province’s updated regulations. Calgary custom home builders recommend placing the principal electrical panel on the main floor of your home, at a location that is elevated several feet from the surface of the floor. As most home flooding occurs in the basement, this strategy shields essential electrical components from extensive and potentially dangerous damage to the panel assembly. Avoiding this type of damage will also allow your home to be continually supplied with electricity in the aftermath of a flood, which will aid any remediation efforts you may need to make. Place the panel in as close proximity as possible to your home’s main electrical load sites. In a typical home, the kitchen has the largest electrical load during peak usage periods, given its dense concentration of high-consumption appliances like stoves and dishwashers. Electrical panels must not be placed in closets, bathrooms, storage rooms, or any other areas where access is restricted. They must remain easily accessible to service professionals at all times. At least three feet of clear floor space must rest immediately in front of the electrical panel. 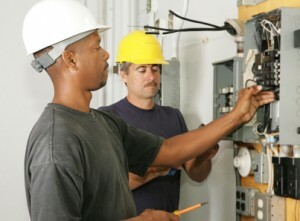 The room in which the electrical panel is placed must measure at least six and a half feet vertically. Two-and-a-half feet of clear space is recommended on both sides of the electrical panel. In addition to relocating your main electrical panel to an upstairs area, Calgary home builders also recommend placing your electrical outlets as high up on the wall as possible. That way, even if floodwater manages to penetrate your home’s ground-level floor, you will stand a better chance of avoiding costly damage to your sockets. Beyond compliance with new provincial regulations, there are added benefits to implementing floodwater damage prevention measures in your new home. The more you do to flood-proof your home, the lower your insurance risk will be. This could entitle you to reduced home insurance premiums, potentially saving you hundreds of dollars per year. Fine Line Homes is a leading builder of beautiful, luxurious and energy-efficient custom homes in Calgary and the surrounding area. We use a comprehensive design and engineering process to help you realize your home ownership dreams with the added benefit of optimized energy efficiency and ecologically conscientious construction techniques. To start, we recommend that you familiarize yourself with our unique process. You can also find a wealth of information on our blog, and we invite you to contact us if you have any questions.